finally i managed to get 2 16 MHZ crystal from one local store.i wired the circuit. and the details are below. 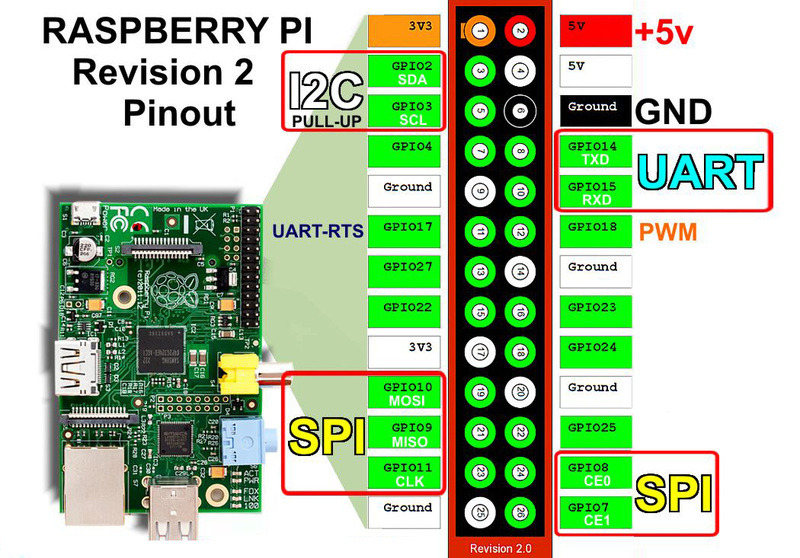 The In System Programming (ISP) method is the one I recommend to use with the Raspberry Pi. 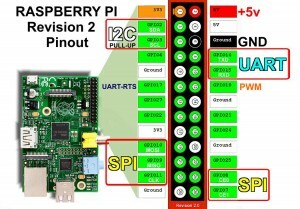 The down-side is that during program development of the code you are running in the ATmega, you need to use 4 GPIO pins on the Pi. 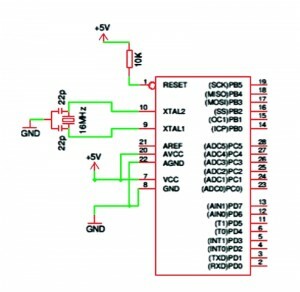 You can pick (almost) any 4, but I suggest you use 4 of the 5 pins dedicated to the SPI interface. To use the Arduino IDE with the Raspberry Pi, you will need to make some small changes to both the Pi’s and the Arduino’s configuration files. However, the first step is to install the IDE, cross compilers, etc. To use the ISP programming method (which is recommended), you need a modified version of the avrdude program. First start by installing the standard Arduino IDE. the OS which i used in RPI is RASPBmc. This will pull in several packages including the required C compilers and Java based IDE. There are several steps involved,Below procedure automates all the tasks for you. 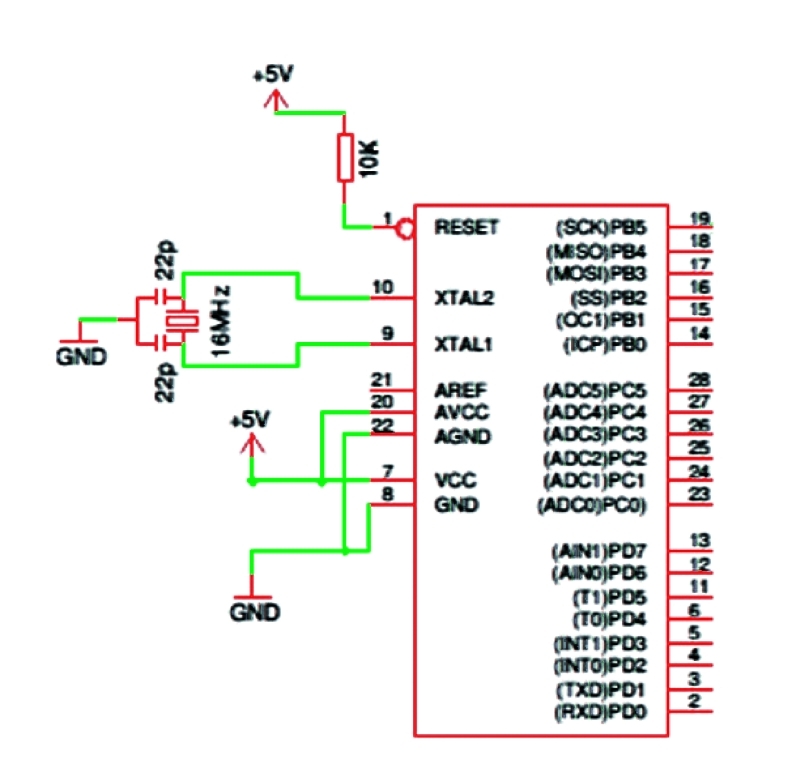 Before we can start to program the ATmega, we need to initialise the chip. The chip itself needs to be told about various parameters such as it’s clock speed, how much flash to reserve for the bootloader (none in our case) and so on. This is known as “programming the fuses”. The first thing to do is to connect the Breadboard Wired ATMega 328P to your Raspberry Pi and install 4 jumper wires from the Pi’s GPIO to the ATmegas ISP port.Below is a basic connection circuit of ATMega 328P on breadboard. Once that’s done, connect the breadboard to the Pi and power up. Once Linux has booted on the Pi, then run the avrsetup command. You will be propmpted for the type of ATmega microcontroller; 1 for an ATmega 328p or 2 for the ATmega168. Nice tutorial! Exactly what I needed to get my Arduino Severino working:) Thanks a lot!